You can spend a lot of time analyzing building system performance, looking for ways to reduce energy use and improve efficiency in HVAC equipment, lighting systems and the building envelope. As you work hard to prolong equipment life, reduce utility bills and lower operating costs, consider high-performance, low-e window film as a solution. The California Energy Commission estimates that 40 percent of a commercial building’s cooling requirements are due to solar heat gain through windows. Improving this exterior element can keep heating and cooling systems from running as long or as often. To improve efficiency, many energy consultants first suggest reducing heating or cooling loads before upgrading the HVAC system. This allows your existing system to operate less frequently, which lowers operating costs and extends equipment lifecycle. To prove this point (and to measure energy-efficiency value from low-e window film), the Hyatt Regency Houston recently installed low-e window film in 48 of its guestrooms. The rooms were located on the southwest and southeast sides of the building (areas receiving the most complaints about uncomfortable temperatures). Using an extensive submetering system, heating and cooling use were measured in the 48 rooms with window film; the data was compared to heating and cooling use in 48 rooms without window film. The results, which were compiled by a third-party energy management consultant and also verified by the local utility for a rebate, found that heating energy use decreased by 25 percent and cooling energy use decreased by 23 percent in rooms with window film. HVAC runtime was also significantly reduced; a system that once couldn’t keep guestrooms cool enough now easily fulfills the building’s needs. The high-rise hotel expects an ROI in 3.6 years as a result of these savings. Low-e window film can also shrink plug load. Because it reduces hot spots and cold spots throughout a space, tenants and occupants located near windows may not need to run fans and space heaters as often to stay comfortable. In the Hyatt Regency Houston study referenced above, the hotel found that window film reduces daytime temperatures near the inside of the windows by 30 to 40 degrees F during hot summer months. The U.S. Department of Energy says that 25 percent to 35 percent of wasted energy in commercial buildings is due to inefficient windows. Long recognized as a way to control glare and reduce solar heat gain in warm months or climates, today’s high-performance, low-e window film improves window insulation year-round in all types of climates. Depending on selection, window film can improve a window’s insulating performance and prevent more expensive replacement in situations where new windows were being considered for increased efficiency. The insulating power of newer technology low-e window film gives single-pane windows the same annual insulating performance as double-pane windows and provides double-pane windows with the same annual insulating performance of triple-pane windows. Installing window film can also help cut back on lighting costs. When solar heat gain and glare aren't controlled, tenants and occupants use blinds and shades to stay comfortable by reducing the amount of natural light coming in. Blinds and shades do control glare and solar heat gain, but they also restrict views and can cause a need for more artificial lighting. According to the U.S. EPA’s Energy Star Building Upgrade Manual, 5 percent of electricity in the United States is used to counteract waste heat generated by lighting systems. 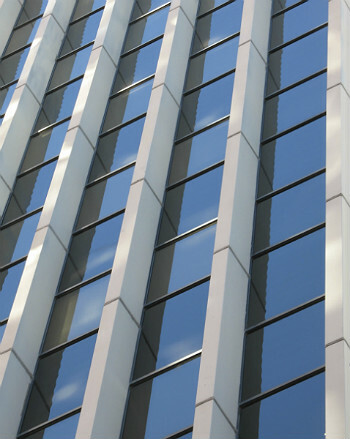 When window film allows controlled daylight into a building, lighting systems can frequently remain off or dimmed, which also reduces HVAC loads. Despite the misconception that window film makes spaces too dark and increases lighting requirements like blinds and curtains might, it actually does quite the opposite. A study conducted by University of Padua in Italy looked at the MG Tower’s use of window film and the effect on lighting. This modern high-rise office building had up-to-date HVAC systems and low-e glazing on the windows. However, occupants still felt the effects of solar heat gain and glare. The University of Padua research team found that window film installation addressed these problems, and also provided a significant increase in useful daylight (and in occupant comfort and satisfaction). For facilities engineers who are ready to tackle energy efficiency and system performance, low-e window film can prolong HVAC and lighting equipment life cycles, add extra insulation to the building envelope, reduce plug load and cut down on monthly utility costs. Steve DeBusk is a global energy solutions manager at Eastman Chemical Company. DeBusk has 29 years of experience in the energy efficiency business. He is a certified energy manager, a certified measurement and verification professional and a certified sustainable development professional. You can visit his blog at blog.vista-films.com or follow him on Twitter @greenbldgs.